The Nancy Reagan of Pollinators | Idealist Girl! This spring I joined the ranks of the estimated 150,000 non-commercial beekeepers in the United States. Backyard beekeeping is quite the trendy hobby here in my neck of the woods, or urban forest as it were. Here in Wallingford, Seattle, I have already encountered four other beekeepers that live within walking distance. Within a few generations, our bees will probably all be cousins. One of many lovely gardens in my neighborhood. 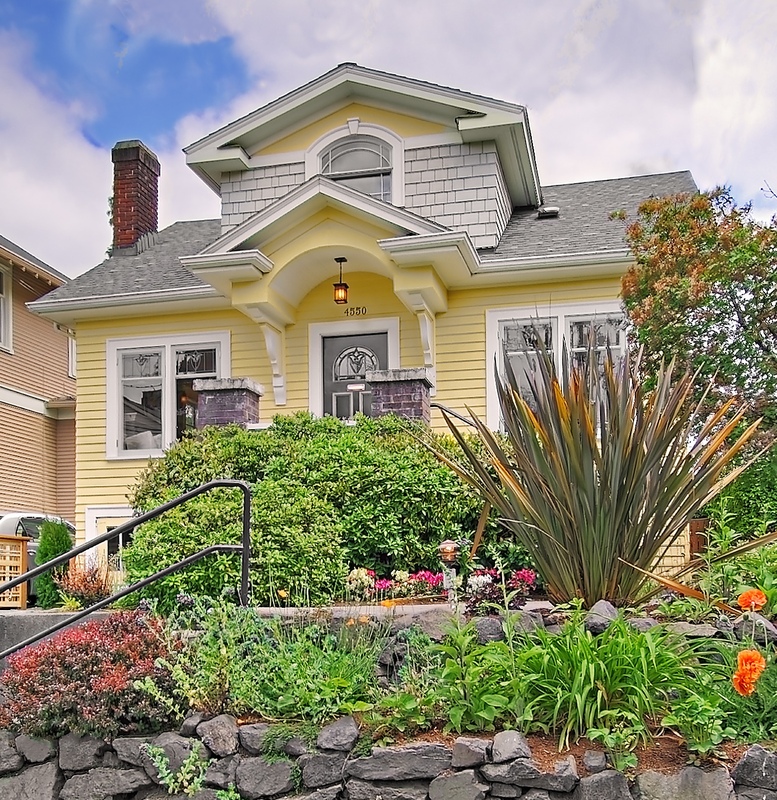 A lovely happenstance of backyard beekeeping in Seattle is that my neighbors all keep lovely gardens with plenty of plants flowering throughout spring and summer. Especially during nice warm spring seasons like this, my bees have plenty of forage from which to choose. I have always enjoyed walking through my neighborhood and admiring the lovely flowers, but I love it even more now that I am looking at them with a pollinator’s eye. Soon I may find myself going door to door as a backyard beekeeping evangelist. Not to persuade others to keep bees (though I am all for that!) but to encourage them to garden organically, for the bees’ sake. This is because some pesticides that people use in their backyards have recently been implicated in Colony Collapse Disorder (CCD), a malady that has been affecting bees since 2006. Colony collapse occurs when hive just up and dies for no good reason that the beekeeper can identify. In most cases, the forager bees wander off, never to return home. The rest of the hive starves. Sometimes bees are also found to be plagued by mites, viruses and other illnesses in unexpectedly high levels. Scientists have been at a loss to explain what causes CCD and various theories have abounded: viruses, genetically-modified crops, environmental contaminants, even cell phone towers. You name it, and someone has been investigating a link to CCD. In all likelihood many of these modern day afflictions probably are affecting the health of bees, and together stressing the bees past the point of recovery. Health problems are often multifactorial, with underlying stressors teaming up to make life miserable. However, increasing numbers of studies are finding that pesticides are probably the underlying cause of CCD. Even on the surface this is not shocking news. Pests are insects that eat plants. Pesticides kill insects. Bees are insects. You do the math. However, the pesticides being blamed for CCD are not your average class of pesticide. They are called neonicotinoids and they are not simply applied topically to the plant. Instead, they are absorbed into the plant and become part of every cell of the plant for up to eight weeks. This is bad news if you are a grasshopper and you eat leaves. This is also bad news if you are a bee and you harvest pollen or sip nectar. The pesticide is in every cell of that plant, pollen and nectar included. Even worse is that the pesticide is not removed by processing. In the instance of corn, a widely-treated crop, it ends up in products like corn syrup. In the winter, guess what commercial beekeepers feed their bees? Yep, corn syrup. So the bees are really and truly screwed. While it’s true that neonicotinoids, imidacloprid in particular, are mostly used by commercial farmers, that doesn’t mean they are not being used in my neighborhood. Where my bees are foraging. If I wanted to, I could walk into Home Depot right now and buy as much of that stuff as I wanted. 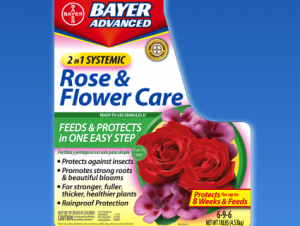 It’s sold as Bayer 2-1 Systemic Rose and Flower Care, Bayer 3-in-1 Shrub Plant Starter, Bayer Complete Insect Killer for Soil and Turf, and Bayer Fruit, Citrus, and Vegetable Insect Control.There’s even potting soil pre-treated with imidacloprid! Don’t buy me. I am evil! And there’s no one to stop me from pouring way too much of it onto my plants, rendering my garden a wasteland from a bug’s perspective! Overuse of pesticides (basically, not reading the application instructions on the bottle) is a big problem among backyard users. Farmers are way smarter about applying the correct amount of pesticide to crops that your neighbor is to his shrubs. Most laypeople tend to think more is better and so they use pesticides in truly hazardous quantities. I’ve been an organic gardener for a long time, so you would have had to catch me 20 years ago for me to even think that using pesticides in the backyard would be a good idea. I can wax poetic about the natural biology of your yard, its careful balance of beneficial insects, and the impacts of chemical fertilizers and pesticides on our watersheds, our food chain and our health. But now I’m an evangelist on behalf of my bees. I really want those tens of thousands of girls working their stingers off in my hives right now to make it. I want them to grow strong brood, produce honey and pollinate the heck out of the flowers in my neighborhood. So the next time you are in Home Depot, please resist the siren call of the pesticide. Think of me, leafleting my neighborhood while wearing my bee jacket. An evangelist for the bees and the precious balance of our ecosystem. 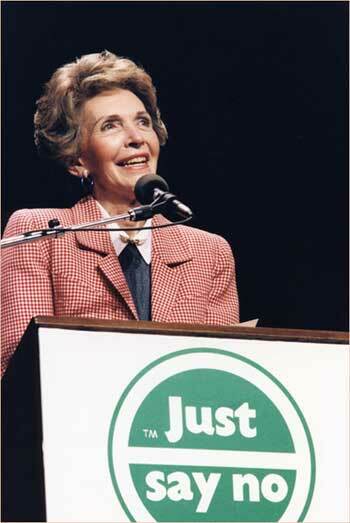 The Nancy Reagan of pollinators, encouraging you to just say no! Encourage your friends and neighbors to garden organically! So many people don’t realize that backyard pesticides are harmful to bees. You can be the one to enlighten them! The girls will thank you. Pingback: Bee Helpful to Your Insect Friends | Idealist Girl!